Bridges of Poplar Creek Country Club in Hoffman Estates, IL, has a new grounds crew: 40 goats will graze on weeds that have sprouted up on some areas of the widely popular course. Looking for an environmentally friendly way to clear the brush, Superintendent Dustin Hugen turned to Green Goats Rental Company in Monroe, WI, for help. 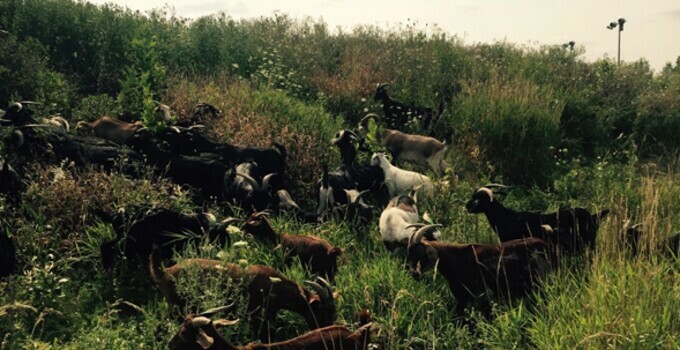 Over the past few years the park district has been mowing to control invasive plant species, but now, using goats will cut costs nearly in half while preventing the use of fire or chemicals. Goats can eat as much as 300 square feet of grass a day; Hugen and company have set aside roughly five acres for their new “maintenance staff” to clear in the next two weeks. The animals will start by the first hole and driving range, indulging on 1.2 acres of brush before migrating to the sixth hole where another 3.5 acre snack awaits. The course will remain open throughout the entire process with Director of Golf, Brian Bechtold, adding there might be some special “goat golf” rates on the horizon. Guests can see the goats from the first tee, but rest easy. The Capra aegagrus hircus – science talk for goats – are well out of harm’s way, safely retained behind a 12-volt electric fence where jugs of water and sweet, salty snacks keep them satisfied in-between meals. Both Betchold and Hugen expect some visitors – or a very, very errant drive – might turn the newest attraction into a petting zoo, but ask that golfers stop by the pro shop first before visiting the goats.